With the festive season already in full swing and as the most dangerous month on South African roads commences, Drive Dry, in partnership with the Johannesburg Metro Police Department (JMPD), will be helping to keep Joburg’s roads safe from drink drivers. 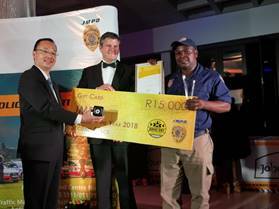 At the JMPD awards ceremony attended by Mayor Herman Mashaba this last weekend, Drive Dry awarded the top performing JMPD Hero of 2018, Gerald Nxumalo, with a brand-new Volkswagen Polo for impeccable service and bringing to book those drivers who do not adhere to the rules of the road. The first and second runners up, Ismael Mgiba and Shumani Netshifume, were also rewarded with vouchers to the value of R15,000 and R5,000 respectively. 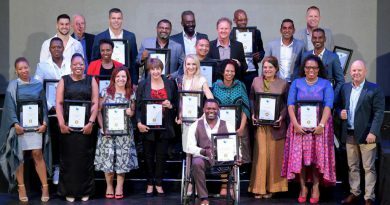 Drive Dry is a responsible drinking initiative by global alcohol beverage company Diageo and aims to combat the abuse of alcohol on South African roads. As such, it has sponsored the prizes for the top officers this season. 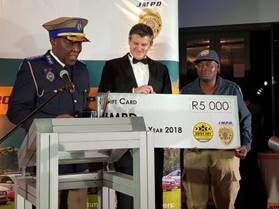 “The JMPD has delivered great results in their attempt to reduce crime and drink driving incidents in Johannesburg this last year and it is our wish to support them. 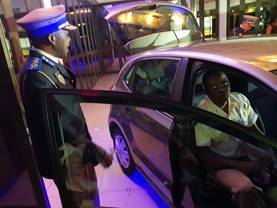 Diageo sees this as the start of what we hope to be a long and fruitful partnership in our mutual quest to keep South African roads free of drink drivers,” says Sibani Mngadi, Diageo’s Corporate Relations Director. With road safety as the number one priority for both the JMPD and Drive Dry, especially during the notorious “silly season”, the collaboration was put in place to ensure stringent law enforcement, by rewarding those officers who conduct themselves in a responsible and appropriate manner and who enforce the rules of the road and don’t take bribes. “We cannot ensure the safety of our people on the roads by working alone. It is through partnerships with private stakeholders like Diageo’s Drive Dry that we will be able to keep our communities safe and reduce the high number of alcohol-related road fatalities,” says Chief of the JMPD, David Tembe. Some of the criteria that was used to assess the winners inlcuded the number of alcohol screenings they conducted over the year which are used to determine if drivers are above the legal limit. Screenings include a breathalyzer test and the collection of blood samples used as evidence for prosecution. Officers were also assessed based on their willingness to go beyond the call of duty, whether they show up professionally at all the times, conduct themselves in a good manner, respect their work and that of their colleagues, use the JMPD resources responsibly, and at no time or situation accept bribes from irresponsible road users and ensure that road users do not consume alcohol or behave in a way that will put other people’s lives in danger. 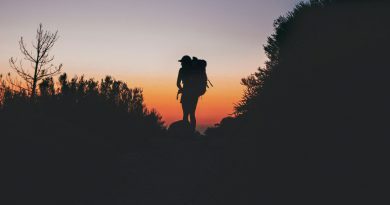 “The collaboration between private and public sector organisations is key to improving the safety and wellbeing of our Johannesburg residents. We look forward to seeing the results of this partnership and a tougher outcome for those drivers who have no regard for the law or for the safety of others,” says Meyer Herman Mashaba.